Below is our review of the Lenovo G580, a 15.6" laptop, featuring 6GB RAM, 750GB hard drive and Windows 8. Lenovo have taken the slightly unorthodox step of choosing primary colours for their G580 range, rather than to stick to a more traditional black or silver colour scheme. 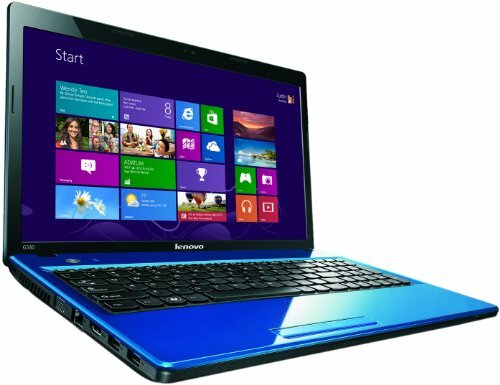 This particular model is finished in a rich blue colour, which doesn't look unattractive - however we get the impression that this will limit their market appeal slightly, as research has proven over the years that aesthetics are a very important factor in choosing to buy items, especially products such as laptops that cost hundreds of pounds. Whilst we didn't mind this colour scheme, our testers unanimously agreed that it won't appeal to as many users as a more neutral and traditional black finish - and as such Lenovo may find they don't shift as many of this particular unit as the rest of their range. This may of course mean that you can fins this model slightly discounted as a result and thus pick yourself up a bargain. The G580 features a decent 15.6" display, which provided a detailed picture and offered comfortable viewing in a variety of environments. Overall dimensions o this notebook were 37.6cm by 24.5cm by 3.4cm - and weight was just over 2.5kg - which is about standard for a notebook of this price range. The slightly recessed keyboard, which spans the width of this notebook, offered easy typing, and was complete with a number pad. The surround was finished in the same blue, which depending on your love for this colour scheme, could be a good or a bad thing. Personally we liked it - the notebook stands out from the norm. In terms of connectivity you are suppled with quite a few options - HDMI, VGA, Ethernet, 2 x USB 3 ports, 1 x USB 2 port, headphone and microphone and DVD drive. The supplied storage on this notebook is a substantial 750GB hard drive - which is pretty impressive considering the overall cost of this notebook. It operates at 5400rpm, and provided pretty quick access during our test. The processor is manufactured by Intel - the B830 from the Celeron range, operating at a rate of 1.8GHz, which is further backed up by a generous 6GB RAM - for the cost you can't complain about this - granted it's not going to be able to compete with high end notebooks, but for the entry level price this is a pretty impressive specification. So overall what did we make of Lenovo's G580? Decent specification for the price, ran fast and performed well. Plenty of storage with the 750GB hard drive. Slightly heavy, as are most laptops in this price range. The blue finish will divide opinions - may not be to everyone's tastes. If you like the blue colour, and have around £350 to spend, then you have no reason not to give the G580 a closer look - the specification is pretty impressive especially considering the relatively low cost of this laptop.